Remember your favorite coin-operated game from childhood? That’s right, the claw machine. 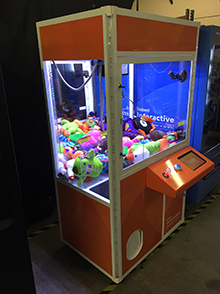 Innovative Vending Solutions now offers fully-customized “activated” claw machines, incorporated with proprietary IVS technology and software.These machines can be customized for your brand and event, including everything from the custom graphic wrap and user interface, to the product that goes inside. 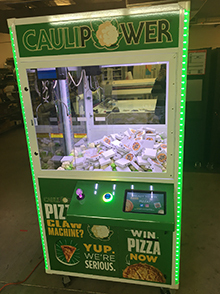 Each claw machine includes a 10” touch-screen that can operate any of the software applications that our vending machines run on, including social media, data/email capture, quiz/survey, QR code scanning, and custom applications as well. 4. 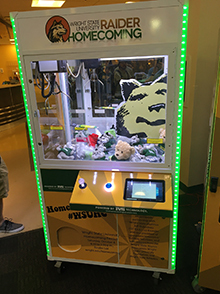 Once the consumer completes the engagement, the screen changes to “Thanks for participating, now take your chance at the Claw!” and the claw is activated for the consumer to have one chance to “grab” their prize from the machine. Unlike claw machines of old, the custom claw machine is a great way to put branded swag, gift cards, t-shirts, etc., in the machine. Most items will work as-is, while others may need to be boxed or even utilize a clear cylinder that will encapsulate the product for easier pick-up. Whether you want to utilize a claw machine alone for your event, tradeshow, or business, or combine it as an add-on to a vending machine engagement, we have you covered.